Tired of the same old investment choices when it comes to your retirement? Consider a self-directed Individual Retirement Account (IRA), administered by The Entrust Group, the only national network of local branded offices providing account administration and education services for self-directed retirement plans. “A self-directed IRA is an IRA that can hold broader selections of investments under different types of IRAs,” said John Paul Ruiz, Director of Professional Development for the Entrust Group. The organization does not offer any direct investments, but instead serves as an administrator for IRAs that hold alternative investments. “The advantage of self-direction is the client’s ability to have the flexibility to explore more investment opportunities and not be limited to what other IRA providers offer,” Ruiz said. Why put your money in alternative investments? For some investors, it’s the hope of seeking greater returns and more diversification. For others, it’s a flight to safety amid memories of the financial crash of 2008. Founded in 1981 by alternative investments pioneer Hubert Bromma, The Entrust Group offers a suite of services to help an investor add alternative investments to their IRA. “Our team of professionals understands the self-direction process first-hand, and they are here to help you explore your options,” said Ruiz. “Entrust professionals are regularly examined to ensure compliance with current state and federal banking requirements, as well as industry best practices. In addition, they keep up to date by participating in ongoing educational programs to ensure that the most accurate information is shared with clients,” he added. Entrust also offers alternative investment education opportunities to clients in the form of seminars, webinars and more. The company also works with financial firms, showing them how to add self-directed investors into their client universe. “We can help you grow your business through the Entrust B2B Program, which is dedicated to educating you and your clients about the benefits of portfolio diversification through alternative investments. We’ll show you how you can tap into retirement funds and expand your client base to include self-directed investors,” said Ruiz. Who’s Putting Their Money in Self-Directed IRAs? 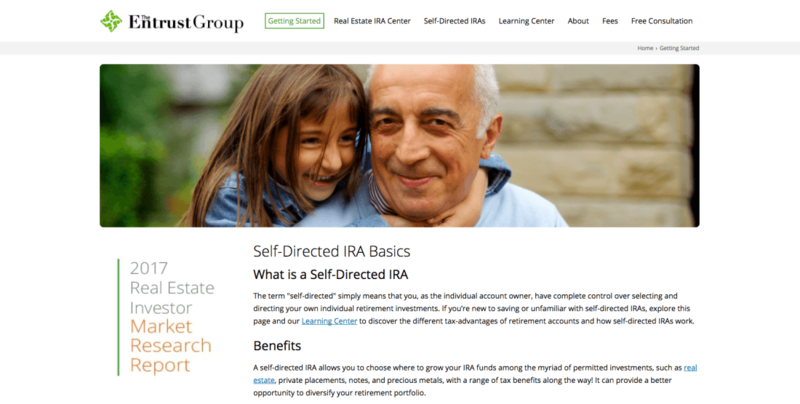 When it comes to choosing self-directed IRAs, The Entrust Group has a wide and varied client base. That includes small business owners, job changers and simply IRA holders who are just looking for more opportunities. And the firm has been growing. “The timeliness of Entrust’s focus on encouraging investors to improve their financial fitness, was demonstrated by the completion of cash and in-kind transfers from other institutions, representing more than $310 million in new assets,” said Ruiz. The Entrust Group now administers over $2 billion in self-directed assets for its clients.” In addition, Ruiz said the Entrust client portal gives investors an overview of their investments, giving them the opportunity to consider investments they would otherwise not have. The portal has been growing, as well. In 2016, the number of people using the Entrust online client portal soared from 500 to 9,800 and accounted for 35% of new self-directed IRA applications. “From our numbers we can see that investors and people alike want to manage their finances and retirement funds in a simple online portal,” noted Ruiz. So the next time you’re selecting funds for your IRA, remember that alternative options do exist and may allow you to enhance returns and protect against a financial downturn. To find out more, head to the Entrust Group website or contact the company directly at (800) 392-9653.